Here at NewscastStudio, we routinely report on new anchor desks. We’ve even reported on ice anchor desks. But this is a first — treadmill anchor desks. WHNS-TV, the Fox affiliate in Greenville, S.C., aired a report on the trend of treadmill desks — and decided it just had to have its anchors try them out (why? probably because it’s sweeps). 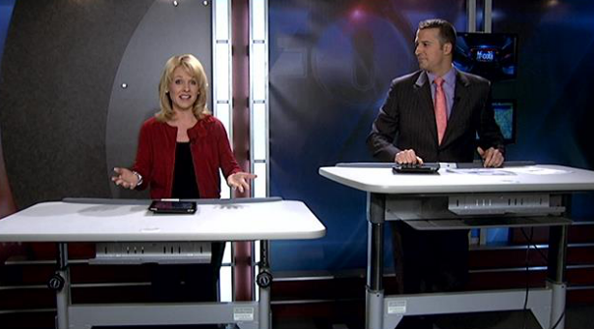 The desks, which were on loan from a local business who also got a nice plug on the station’s website, were used for a portion of the newscast while anchors Cody Alcorn and Diana Watson read the news (insert news anchor walking and chewing gum joke here).